Doc Riojas was born in 1931 in Dolores, Texas. He enlisted in the U.S. Navy on September 29, 1948, and completed basic training at NTC San Diego, California, in January 1949. Riojas next attended U.S. Naval Hospital Corpsman School at the U.S. Naval Hospital in San Diego from January to April 1949, followed by service as a Hospital Corpsman at the U.S. Naval Medical Center at Bethesda, Maryland, from April 1949 to June 1950. Petty Officer Riojas served at Naval Air Station Anacostia in Washington, D.C., from June 1950 to August 1951, and then received Field Medical Corpsman Training for service with the Marine Corps Fleet Marine Force at Camp Lejeune, North Carolina, from September to October 1951. His next assignment was as a Hospital Corpsman with 2nd Battalion, 1st Marine Regiment of the 1st Marine Division in Korea from November 1951 to March 1952, and then with the 1st Medical Battalion of the 1st Marine Division in Korea from March to December 1952. Petty Officer Riojas next served with Headquarters & Service Company, 3rd Marine Battalion of the 3rd Marine Division at Camp Pendleton, California, from January to August 1953, followed by service at NAS Corpus Christi, Texas, from August 1953 to January 1955. He attended the Navy Deep Sea Diving School at the U.S. Naval Gun Factory in Washington, D.C., from February to September 1955, and then served as a Medical Deep Sea Diving Technician attached to the Submarine Escape Training Tank as an instructor at U.S. Naval Submarine Base Pearl Harbor, Hawaii, from November 1955 to June 1956. His next assignment was as a Hospital Corpsman aboard the submarine rescue ship USS Coucal (ASR-8) from June 1956 to June 1958, followed by service as a Hospital Corpsman at the U.S. Naval Hospital at Corpus Christi from January 1958 to June 1959. Petty Officer Riojas attended the Hospital Administration Technician C School at the U.S. Naval Hospital at Portsmouth, Virginia, from June 1959 to April 1960, and then served at the U.S. Naval Weapons Plant in Washington, D.C., from April to August 1960. He next attended Divers Refresher training at the Deep Sea Divers School in Washington, D.C., from August to September 1960, followed by service aboard the submarine rescue ship USS Skylark (ASR-20) from September to October 1960. He served aboard the submarine tender USS Fulton (AS-11) from October 1960 to April 1961, and then aboard the submarine tender USS Proteus (AS-19) from April to June 1961. 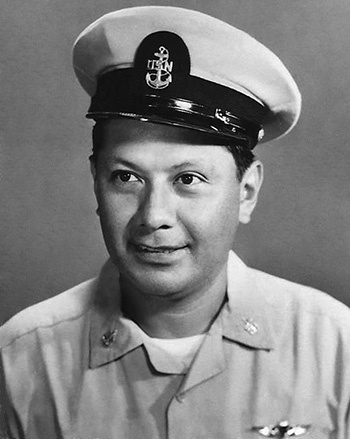 Chief Petty Officer Riojas returned to the USS Skylark from June 1961 to December 1963, and then served as an instructor with the Submarine Escape Training Tank at the U.S. Naval Submarine Base in New London, Connecticut, from December 1963 to July 1965. His next assignment was as an instructor aboard the submarine tender USS Simon Lake (AS-33) from July to August 1965, followed by service as an instructor at the U.S. Naval Underwater Swimmers School at Key West, Florida, from September 1965 to March 1967. Chief Petty Officer Riojas' final assignment was with SEAL Team TWO at Naval Amphibious Base Little Creek, Virginia, from March 1967 until his retirement from the Navy on November 13, 1970. During this time he deployed to Southeast Asia with SEAL Team TWO from October 1967 to April 1968, and with Naval Special Warfare Group Vietnam from October 1969 to October 1970. 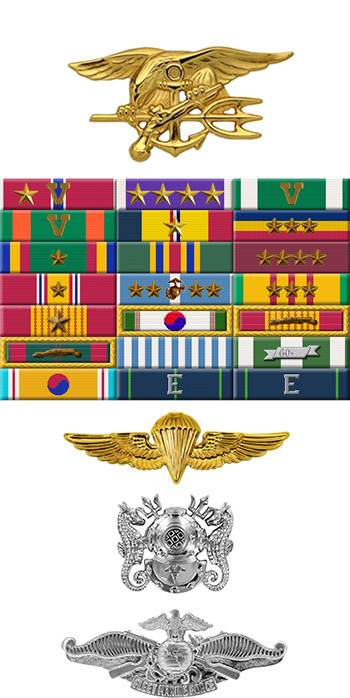 For heroic achievement while serving with friendly foreign forces engaged in armed conflict against the North Vietnamese and Viet Cong communist aggressors int he Republic of Vietnam. On 24 November 1969, Chief Petty Officer RIOJAS was serving as corpsman with a United States Navy SEAL Platoon which was conducting operations in the Rung Sat Special Zone. He was patrolling near the point element through dense undergrowth and shallow water in an area of recent heavy enemy activity when he patrol observed a camouflaged sampan in a small canal. As the patrol was cautiously proceeding toward the sampan, the point man detected two armed Viet Cong outside a bunker. During the ensuring fire fighter, the point man and his machine gunner were seriously wounded. With complete disregard for his won personal safety, Chief Petty Officer RIOJAS rushed to the aid of the wounded point man where, while administering first aid, he was wounded in the leg. Disregarding his painful wound and the intense enemy fire, he pulled the wounded man back to safety and continued to administer first aid. After being relieved by another SEAL, Chief Petty Officer RIOJAS courageously made his way back to the front of the patrol to assist in the treatment of the gravely wounded machine gunner. His initiative, sense of responsibility and courage under fire were directly responsible for saving a shipmates life and were in keeping with the highest traditions of the United States Naval Service.